Just last week I posted a recipe for Paleo Mocha Chocolate Chip Cookies. A salad or a healthy fish recipe would seem to be in order after that. Posting two dessert/treat recipes in a row seems overly indulgent. But I have been having a lot of fun experimenting with almond flour and this Paleo Chocolate Chip Cookies recipe is the result. I can’t wait to share it because it turned out really well. Almond flour has a high fat content. Using it in recipes generally results in moist confections. This can be a good thing when making cakes but when it comes to cookies I prefer something a little more firm and possibly crunchy. To make this happen in a chocolate chip cookie recipe I decided to add some coconut flour. Coconut flour is the opposite of almond flour in the sense that it is very dry. A little bit goes a long way. I have been playing around with combining these two flours to get the optimal mix for a cookie. The result is a tender chocolate chip cookie that has a little bit of crunch around the edges. It’s paleo because it is grain-free, gluten-free, dairy-free and legume-free (I have actually seen cookie recipes that use bean flour!) These paleo chocolate chip cookies are even vegan. This cookie is also non-political and loves puppies and little children. Basically, this is the perfect chocolate chip cookie. Here’s Nathaniel posing for me. This child really should be paid to be my model. He is always being asked to pose and does a great job. Someday he may command a hefty fee but for now I get away with giving him cookies for his hard work as my model. The cookies were surprisingly similar to other chocolate chip cookies I have had. It’s hard to believe this recipe uses no grains. The cookies are soft and moist. Once they are completely cooled they develop a little more crunch but still remain moist. 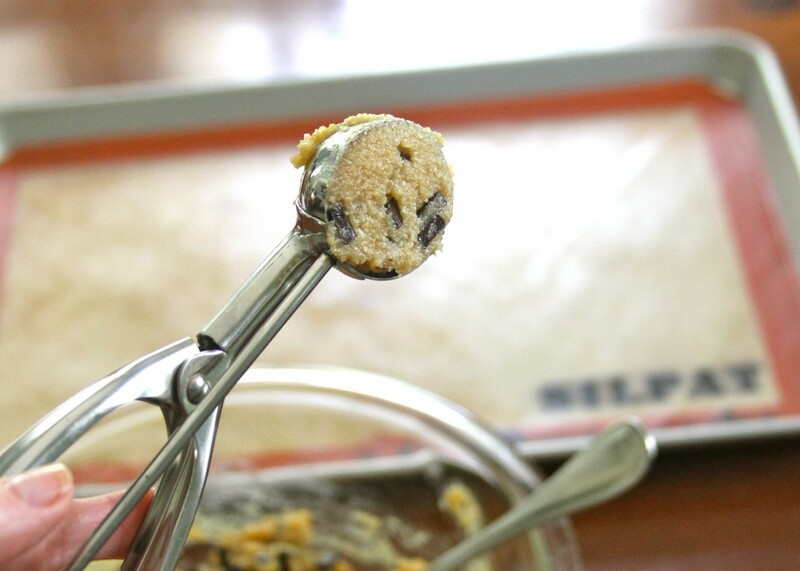 * I had never used a cookie dough scoop until just recently but the dough is very sticky and the scoop makes the process much easier. If you give these cookies a try, leave me a comment. I would love to hear what you think. And if you use substitutions it would be great to find out about your results. 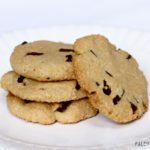 131 Responses to "Paleo Chocolate Chip Cookies (Gluten-Free & Vegan)"
Would it be OK if I was to use just almond meal/flour instead of the blanched one? I have not tried the recipe with anything other than the Honeyville brand. I have heard results with things like Bob’s Red Mill Almond Flour can give you a different result because it does not have as fine a texture. But I suspect that may be more true for things like cakes and muffins. Other almond flours would probably work fine in this recipe. You just might get a courser result. I used Bob’s Red Mill Almond Flour and they still tasted really good, but they came out flat, unlike the ones pictured on your site. I’m just getting into the gluten free baking. I used spelt flour, the maple syrup, and butter. I only made half of a batch to see how they would turn out, as most of the ingredients are rather spendy for trial and error. Happy to say, they turned out great! Better than I had expected. Hi, I have tried these a few times and love them. However, I use honey instead of coconut nectar or syrup. Another thing is that they always come out flat, never like the ones pictured. Should I reduce the liquid being used? I used Kroger’s organic brand of almond flour, and they came out just like the picture. Also, I found the Enjoy Life chocolate chips there, too! When I made the full recipe, they came out flat, but when I made a half recipe, they were exactly like the picture. I also bake mine on a stone. Hi im wanting to make this recipe to support my new pcos diet and wondered if you can use Wholegrain spelt flour instead? As almond flour is so expensive!! You are correct about almond flour being expensive. But I don’t generally eat grain-based flours and don’t have experience working with spelt so I can’t say for sure whether it would work in this recipe. When purchasing almond flour, make sure it is made from the entire almond. Many store bought flours have removed part of the almond and sold it in another form leaving a less desirable product. I purchased a large bag of almonds at Costco and grind the almonds myself (coffee grinder works best). You can grind a couple of cups and freeze it, that way it’s always on hand when you need it. I do the same with coconut flakes, just grind it and you have coconut flour. I agree about grinding the almonds into almond meal. But I don’t find that grinding coconut flakes makes the type of coconut flour that can be used in most recipes – at least my own recipes which are based on the much drier version of flour that is commercially available. I have heard of people using coconut flakes to make coconut milk, then dehydrating the remaining flakes and THEN grinding them for flour in a coffee grinder. That flour is more similar to the type I use but the measurements would be somewhat different for a recipe. So the point is, you can save a ton of money making it yourself – just beware about trying to sub in recipes that call for a lot of coconut flour. Any recommendations on making this nut-free? Sounds awesome! I am also looking for a nut free. could you use just coconut flour? Or Quinoa flour? Made these and didn’t have coconut syrup or maple syrup on hand so used the Date Lady date syrup had on hand and they turned out great. All other ingredients were as listed. Great paleo treat. Thanks. Thanks for letting me know, Suzanne. I would like to try them without the sugar too. I love shortbread. Is coconut nectar and coconut syrup the same thing? In my experience, yes. And coconut crystals are the dry version. I think they are awesome! Thanks for sharing. Just made these with trader joes almond meal, and trader joes agave nectar. (I didn’t have either syrup, or blanched almond flour.) I also used the enjoy life chocolate chunks and coconut butter. I am in cookie heaven. Thank you so much for this recipe. I am new to gluten free baking and this was super easy. Thanks for letting me know, Angie. I have some Trader Joe’s almond meal that I would like to use up. I just made these with almond meal too, by accident because I’m new to this so I didn’t know there was a difference: ) I used the same measurement as the recipe and they were a disaster. Did you adjust the amount of meal you used? These are awesome! I am making my second batch this week! They freeze well too…tried to freeze some to keep myself from gobbling them all up but it didn’t stop me lol. Almond flour is quite pricey though…have you tried making any cookies with coconut flour (or at least the majority)? Just curious. Keep up the tasty recipes. Love your site! Just wanted to let you know that my boyfriend has requested these cookies three times since the first time I made them. I add dried cranberries and coconut flakes in mine for an extra something something. If you have any other vegan paleo recipes I’d love to try them! That’s great, Dee. I’m glad you guys like the cookies. A lot of my dessert recipes have eggs in them but I try to designate things “vegan” when they qualify. I like the cranberries and coconut idea. I have some dried cherries I would like to use and this might be the recipe. Wow, made some tonight! They flattened out a bit more than your picture, but they were really good! I used the Enjoy Life Mini Chips you suggested as well. Very impressed, as were my son and my niece! Thanks! I will be definitely be trying it this weekend! Thanks! Hello! Thank you for this recipe! I was looking for cookie recipes and stumbled upon this one and was really excited because it is egg free as my son is allergic to eggs! Mine definitely did not turn out like yours which was to be expected because I didn’t follow it exact. Mine did spread on their own so due to me spreading them before baking they were incredibly thin and fell apart around the edges, but no big deal! I used Bob’s Red Mill almond flour, and maple syrup. Also, I decided to add in a couple tsp of almond butter just for kicks. I was a little worried because the dough all stuck together (due to the adding of almond butter) and as I mixed in the choc chips it sort of started to put off a liquid, but I kept on going! Now, you initially said you liked your cookies crispy, but mine turned out so incredibly chewy and delicious! I couldn’t believe it! I was shooting in the dark and couldn’t believe how awesome they are for so little ingredients! And my 2 1/2 year old son loved them! Thanks again! Oops also you were correct they did look a lot more corse due to the Bob’s Red Mill almond flour, but I do not think that effects the taste texture. I think next time I will bake it as a whole and cut them like cookie bars! I’ve never tried it as cookie bars but I bet that would be good. Let me know how it turns out. So I am probably the worst baker there is. I usually manage to burn, melt, or just plain ruin everything . I managed to make and bake these for a paleo potluck, that our crossfit gym is having, and absolutely loved them. So much, that I made a second batch after because I was so impressed with myself. Thank you for the amazing recipe! They are extremely delicious! First one that has worked for me yet. Ah yes, the lick-the-bowl trick. I know it well. My youngest son is a professional cookie dough bowl licker. So glad y’all liked them! Mixed them up, re-read the recipe to see where I goofed…I didn’t. Gave up, poured batter (yes batter) into an 8×8 glass pan to bake. my primal/paleo family LOVES these, and i am so happy to finally eat cookies again! (i have a recently diagnosed egg allergy, and it’s been killer saying goodbye to some of my favorite paleo recipes!) thank you so much! Hi, recipe looks amazing…but I’m new to paleo, can I get all the ingredients at trader Joes? I know they have almond meal. You can use that instead of almond flour but it may be a somewhat different textured result. They carry coconut oil now. I do not believe they carry coconut flour yet but you can probably find that in the regular grocery store. They carry maple syrup but maybe not coconut nectar. Definitely chocolate chips. Maybe. It depends on the Whole Foods store. I have only found blanched almond flour online. Coconut flour from Bob’s Red Mill brand is widely available. I’ve seen that brand and other cocnut flour brands at Whole Foods. I just found coconut flour and almond flour at Shop Rite! Check you the baking sections, you would be surprised all the specialty things they are carrying now!! I have been buying coconut flour (Bob’s Red Mill brand) at Shop Rite but I have never seen almond flour. This is great news. I’ll look for it next time I’m there. We just switched over to Paleo and what a joy to find this recipe! We tried it today and I made more for a bake sale that never seems to have gluten free items. I did not have coconut nectar so I used shredded coconut and for a little more moisture (not from the oil either, but to also add just a touch more sweet flavor) I used chocolate almond milk. They came out GREAT! Thanks for posting this recipe!! You’re welcome. Isn’t that always the case with bake sales – nothing gluten-free. I’ll bet plenty of people will appreciate having an alternative. Good for you! Your tweaks to the recipe sound good to me. These were wonderful! The whole family was happy to have a good cookie in the house! Thank you! Yumm! First try at making a Paleo sweet treat and they were PERFECTLY Delicious! 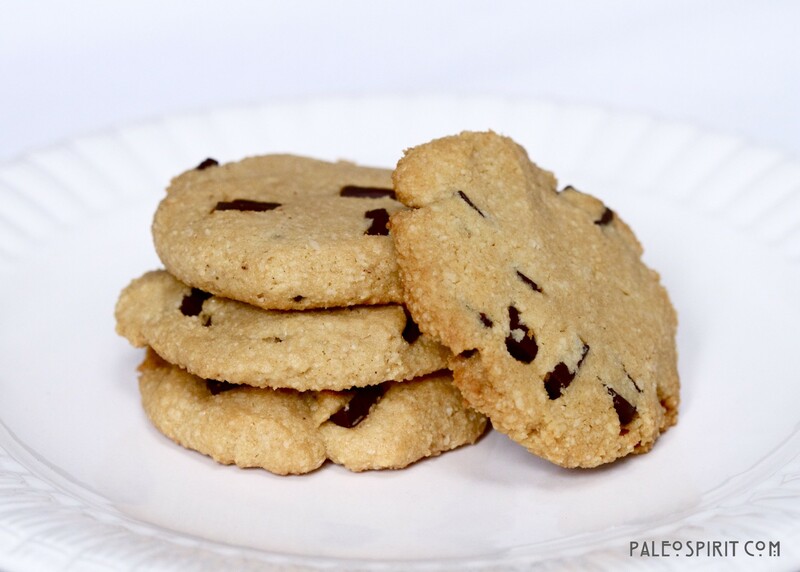 I used Bob’s Red Mill Almond Flour and Enjoy chocolate chips as that was what I had on hand and they were still delicious! My son said they were they best Paleo food yet and I am excited to have treats back on the menu. Thank you from our whole clan. Yay! I’m thrilled to hear it. THanks for letting me know. I have been scouring the internet for gluten-free/vegan. I never realized it was paleo! Any suggestions for how I might sub the coconut nectar for liquid stevia? In other words, is the bulk of the nectar necessary for the batter to be the right texture ie not so dry it won’t form? Thanks! 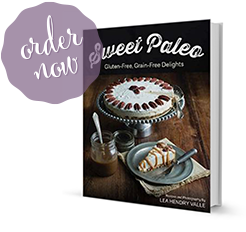 Paleo is always gluten-free but not always vegan because it includes meat in many recipes. However, because we generally do not eat dairy there are often recipes (especially side dishes) that are vegan. 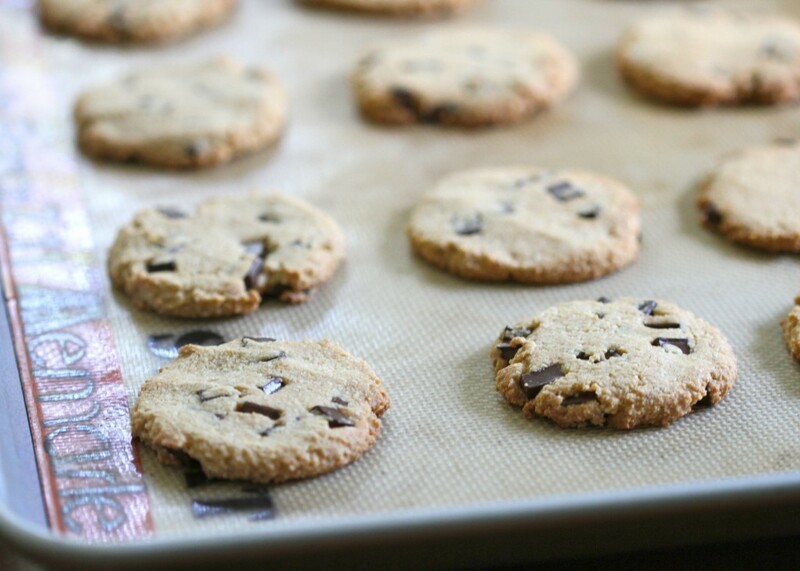 This chocolate chip cookie recipe is one place where paleo folks and vegans can come together. 🙂 I’m not sure about the stevia substitution because I have never done it. There’s a 1/2 cup of nectar/maple syrup which is substantial enough that I would say you definitely need the moisture. You could try using stevia for the sweetener and then adding some other liquid to make up the difference. Good luck! Best paleo chocolate chip recipe yet! Thanks! Thank you for a great recipe, this will be my go-to cookie recipe. Oh my goodness!!! These are awesome! Thank you so much! I’m dabbling in Paleo but have a huge sweet tooth I’m not ready to give up. LOVE these cookies! Better yet, my 10 year old daughter who is not, shall we say, necessarily on board with Paleo loves them too! I used maple syrup and the “Enjoy Life” choc. chunks. SO good! Awesome! I know how those 10 year olds can be. That’s how old my oldest son was when we started following paleo. Good luck with the transition! And thanks for the feedback. You knocked it out of the park again, Lea! I added two tablespoons of shredded coconut and they were a lot like macaroons. Crispy on the outside and chewy on the inside. Delicious! Fabulous recipe. Doing a Whole Life Challenge with no sweeteners, no dairy, no grains allowed, so this recipe is a godsend (I used chopped dates and orange rind instead of choc chips and left out the agave nectar). These are amazing! My only complaint is that I tend to eat too many in one sitting! Thank you for the recipe!!! I have had a hard time finding Choc chips that are soy lecithin free. Are these? Enjoy Life brand chocolate chips are soy and gluten free. I made these and my whole family loved them! I made 1/2 the batch with Choc chips and 1/2 the batch with pecan pieces. We used maple syrup for a good rich flavor. I like them frozen. 🙂 Thanks for letting me know about these choc. chips that are soy free! I used honey instead of maple syrup, and used normal almond meal! They are absolutely delicious and the children love them. Thank you so much. Hey, if the children love them then that’s just about the most important thing. 🙂 Thanks for the feedback. I have made these many times and LOVE them! But does anyone have any advice on flattening them before baking? If I use a metal spoon or my fingers the batter just sticks and makes a mess. Help? We’re making them right now and I literally just flattened mine out with my fingers about 5 minutes ago. They didn’t stick for me. If your batter is sticking, you might consider refrigerating the dough a bit before you try to flatten them out – that might help. Thanks for a great recipe. I have made these a few times and the last time, I didn’t have time to bake them right away. I refrigerated the dough and baked them the next morning. I didn’t have any problems with stickiness this time. I think that is the way I will make these from now on. These were simply amazing! Ended up grinding my own almonds because I realized I didnt have the flour on hand (so some of the cookies had random larger chunks of almond in them! Surprise!) and even shared some with colleagues who really appreciated them. I used Ghiradelli chips which are beyond par! Thank you so much for posting! Can i use date syrup instead of coconut nectar or maple syrup? I made these yesterday and they are awesome! I changed 2 things: I used honey instead of the coconut nectar, and I refrigerated the dough for 30 minutes before scooping onto the baking sheet. The dough was falling apart too easily without chilling it first. Much easier to scoop and flatten after chilling! So grateful for your recipe! We’ve already made them three times (including Thanksgiving last night) since discovering them three weeks ago; we usually eat them right off the cookie tray. They are absolutely delicious! We’re now looking for an equally awesome vegan/glutenfree pumpkin bread recipe. As I am new to gluten free/vegan baking, if anyone can offer any hints as to what l can try next time I’d be very grateful……….. I think the problem may be the honey. Honey is usually thicker and stickier than coconut nectar or maple syrup. I could see how that might make them more pliable and chewy. You might consider trying maple syrup in the recipe. I find it makes them crunchier though they tend to soften up if you put them in an airtight container. BEST COOKIES EVER!!! The first time I tried them I thought they had grains which I can’t have so I said no to the cookie, then the person with offered it to me said it was Paleo and Vegan. I ate 3 of them Saturday and Sunday they were SO GOOD!!! That’s a funny story, Jen. We do sort of default to the “no thank you” because we assume we can’t eat it. I’m glad the person went the extra step of explaining what they were so you didn’t have to miss out! I was thrilled to come across this recipe. I couldn’t find any pure chocolate chips, but simply broke apart a dark chocolate bar into tiny bits. The coconut oil I used was room temperature, and when I added chilled pure maple syrup, the oil solidified slightly. At first, I was worried, but it may have actually made for a more manageable texture. I don’t have a cookie scoop, but the dough wasn’t too sticky when I rolled it into balls. I made these as my “one month of the paleo lifestyle treat”. Thanks! I will definitely recommend your site! Amazing cookies!!!! I used maple syrup instead of coconut nectar. I can’t stop stuffing my face with them now 🙂 Thank you for the recipe!! I stumbled across these while searching for a paleo doughnut recipe. I used bobs red mill which i find to be a bit mealy, but fir first go round it satisfied my 3 year old who had been asking for chocolate chip cookies. And since we went GF in august 2012 after him being hospitalized for a week due to intestinal issues i usually made GF cookies, but his intestines are super sensative to any sticky substance so we began paleo last month after being informed he was having issues again. I have tried lots of paleo cookie recipes but he has a small allergy to coconut, which seems to be in everything paleo. I also subsitituted almond extract as he is extremely allergic to vanilla. They are sweet and cruch/chewy. Turned out exactly like photos. I did however allow the mixture to rest for 5 minutes before i stirred and portioned. I used the red mill almond flour and I used the maple syrup bc that is what I had and the only problem I had was they were sticky so I couldn’t flatten them. Still very tasty though. All try the coconut nectar next time. What a great treat! I “tweaked” it out of a shortage of flours and wanted bars. I halved the recipe (I ground my almond flour in the food processor.) I used maple syrup and butter. I spread a thin layer in the pampered chef square baking dish. I spread it out by using wax paper on my fingers. I baked 15 minutes initially, then turned off oven and just left them for over an hour. Presto! Crunchy chocolate chip bars! Happy day! This was my second attempt at making paleo chocolate chip cookies. The first recipe did not taste like cookies, but this recipe was GREAT. And my husband who is very picky and hates all things healthy ate them. He even had seconds. Thank you so much. 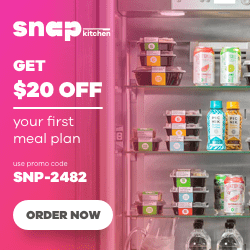 I will try some more recipes from your website. Thank you so much!!!! You’re very welcome! Glad to hear it. Omg! Best cookies ever! Thank you very much! Finally, no more flat cookies!! have tried these several times now and with a few tweaks, I finally got them to turn out perfectly! They’ve always tasted wonderful, but I wanted them to come out looking more like the ones in your pictures! My first few tries (using coconut oil or coconut oil + a little butter) produced slightly runny batter and very flat cookies. This time, they were just right! I used mostly butter, plus 1-2 T coconut oil (until I had a 1/2 cup total), a rounded 1/2 tsp baking soda, 2 rounded T coconut flour (rounded vs leveled flat), 1/2 c maple syrup, and only 1/2 T vanilla. Don’t skip the steps where you mix the wet and dry ingredients separately before combining! I also added 1/2 c chopped walnuts. I use Ghirardelli 60% cacao and this time, I didn’t flatten the scoops of dough. I baked them at 350º for 12-15 mins. Also, it’s important to let these cool so they don’t completely fall apart when you try to eat them. I hope this helps anyone who has had the flat-cookie problem! I made these cookies by just blending raw almonds in my vitamix and used raw honey instead of coconut nectar bc that’s what I had on hand. I only used about 1/4c honey too. The cookies are a little textured but we loved the crunch! My husband and extended family LOVED them. My brother asked for the recipe. Baking Soda isn’t “paleo”. Does your recipe work without it? Actually baking soda is considered “Paleo” given that it is not a grain, legume or dairy product. It’s just sodium bicarbonate that comes from a naturally occurring mineral. (Baking powder often contains corn starch which is why many consider that not to be paleo.) If you take that view because “cavemen” did not eat baking soda then all I can say is I do not personally follow that line of thinking. It is impossible to fully replicate their lifestyle and even if I could I would not choose to do so. The best question to ask is “is this ingredient harmful to my health?” Having said that, I do not know if the cookies work without baking soda because I haven’t tried it without that ingredient. If you do try it feel free to let us know how they turn out. Hi, was wondering about the calorie info on these cookies. Almond meal/flour is pretty high fat and I’m trying to find some figure friendly indulgences to have from time to time. Thanks! I don’t have the time to research the calorie counts of recipes but I’m sure you could estimate by googling some of the ingredients. Good luck! OMG the best grain free cookies ever! Thank you so much for this recipe! I made them over the weekend and they last so well when in fridge. I had the hardest time finding a dessert I could make–I’m on the autoimmune protocol diet–and these cookies were a real treat. Just made these and they were AMAZING!!! My boys and husband almost finished off the entire batch 😉 I ended up using a 1/2 cup of raw honey instead of maple syrup/coconut nectar and the batter looked/felt exactly like normal cookie batter!! Hii!! I am a fan.. I just love your recipes.. Do you know how many calories are there in these chocolate chips recipe??? 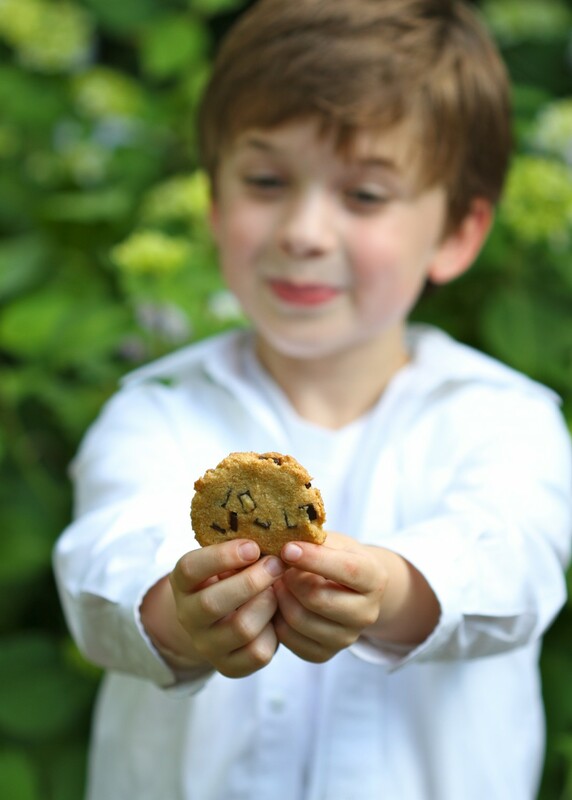 Every time I make these cookies and share them with others- they want the recipe! Even ppl who aren’t health nuts! Made these for first time and love. Great paleo treat. I didn’t have coconut or maple syrup on hand so made with Date Lady’s date syrup that I had and they taste great. Other ingredients were as listed. Made these again tonight!!! Thank you! What a fab recipe! You’re welcome Kelly. I’m glad you like the cookies! I just found this recipe and can’t wait to try it! Thank you Lea for your recipes and thanks to everyone for their helpful questions and comments! Great recipe! I baked half a batch and used xylitol instead of maple syrup, since I didn’t have the latter… Fortunately, they turned out fantastic! Can’t wait to make them again — this time with maple syrup. Cheers! I am very new to baking without wheat flours. I just finished making a batch of these cookies, using the combination of Bob’s Red Mill almond meal/flour, ghee, & coconut nectar. I have to say, they are REALLY seriously delicious! That buttery ghee flavor comes through wonderfully. I believe using Bob’s Red Mill made them come out flatter than pancakes though. They’re almost sort of lacy looking. But so, so good. I’m in a rural area, and don’t have access to the Honeyville almond flour you mentioned using, but am ordering some from Amazon, though I wouldn’t mind making them this way again. Hey, if the Bob’s works then you could just stick with that. I think the biggest difference between the flours is in baking things like muffins and cakes. Cookies you can kind of get away with the more coarsely ground flours. Thanks for the excellent feedback! I just made the chocolate chip cookies! They are fantastic, thank you, thank you! I’ve been searching for a great CC cookie recipe and now I’ve found it. I used my Trader Joe’s Almond flour and sifted it because it can be a bit grainy, perfect cookies! These cookies are amazing! Taste better than toll house! 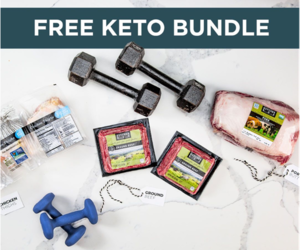 I am new to paleo, and these are making the transition so much easier. thank you! You are very welcome. So glad you like them and took the time to comment! You’re right, raw cacao nibs WOULD be great. I love it when kids like my recipes! Thanks for letting me know. LOVE this recipe. I use almond meal, maple syrup, coconut oil…add some cinnamon. And I don’t flatten the cookies before they bake. They turn out AMAZING. The almond meal definitely gives a granier/heartier texture, but I’m into that. Love this recipe. Cookies were amazing! I cannot thank you enough, I must admit, I was certain they would taste horrible…but they are delicious!!! I am doing paleo and doing ok besides the desire for something sweet. I’ve tried a few things and have been disappointed but I am thrilled to have found this! They are perfect for me and I am not a “cookie” person. Thanks so much! I used shortening and maple syrup as subs and they are so good I keep having to make them often because I eat them so quickly. Awesome. Glad you like the recipe, Jana. We just made them for a potluck this past Sunday and people who aren’t “paleo” were full of compliments. These are the best Paleo chocolate chip cookies that I have baked! I followed the recipe, using coconut oil, pure maple syrup, and “Enjoy Life” Dark chocolate morsels as my choices. After mixing, I placed the dough into the fridge (approx. 10-15 minutes) to harden a bit. 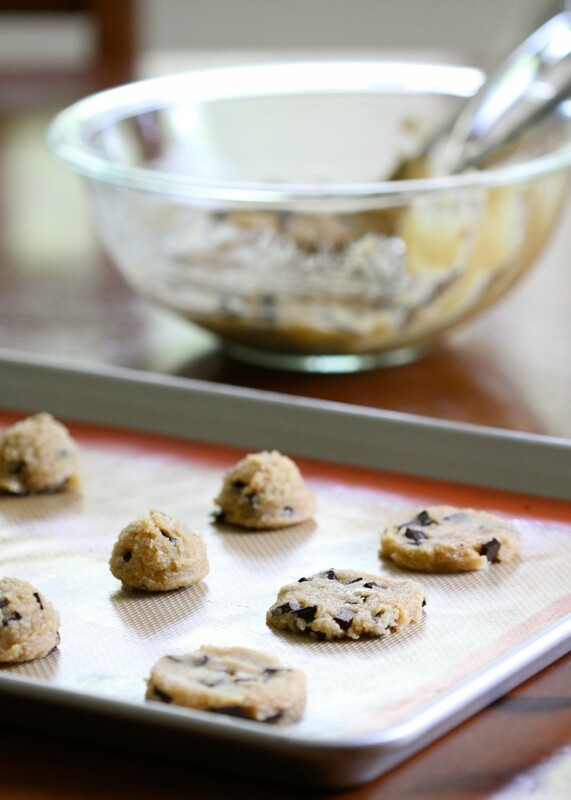 It was easy to form on parchment paper, pressed down a little, & right into the oven. I baked them 10-11 minutes and they were crispy on the edges and chewy on the inside! These will be our go to cookies for a long time!! Delicious! !